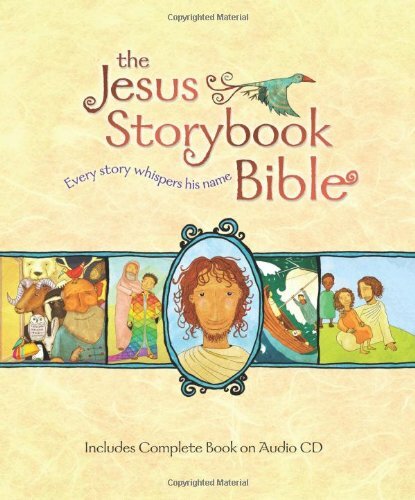 Every Story Whispers His Name The award-winning Jesus Storybook Bible invites children to discover—through full-color illustrations and three read-along CDs—that Jesus is at the center of God’s great story of salvation... and at the center of their story, too. This beautifully crafted deluxe edition, with ribbon marker and audio CDs, is a wonderful gift and sure to become a family treasure. I wrote this so children could know that God is for them and loves them with a Never Stopping, Never Giving up, Unbreaking, Always and Forever Love. Sally Lloyd-Jones is a leading writer of inspirational books for children. She is the author of three bestselling children’s Bibles, including the Gold Book Award-winning Baby’s First Bible and, most recently, the Moonbeam Award Winner and ALA notable, The Jesus Storybook Bible: Every Story Whispers His Name. She has written many picture books for children, including the critically acclaimed New York Times bestseller How to Be a Baby: By Me, the Big Sister. Sally was born and raised in Africa, was schooled in England, and now lives in New York City. She can be found at www.sallylloyd-jones.com.